Jonny Margetts’ brilliant 28th minute header handed Matlock victory against bottom of the table North Ferriby in a scrappy clash at the Proctor Cars Stadium on Saturday. The result all but condemned the Villagers to a second successive relegation. It was the highlight of a frustrating afternoon for most of the 405 crowd who were perhaps expecting an avalanche of goals from the Gladiators. 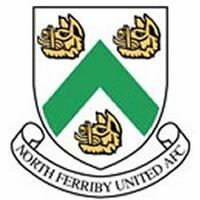 But Matlock came up against a dogged North Ferriby who showed little ambition in an attacking sense. Ross Durrant in the home goal was largely redundant, not having a save to make throughout the contest. The Gladiators dominated the first half and ought to have been in front by more at the half time whistle. But after the break there was a dearth of constructive football from either side .It led to increased frustration on the terraces and on the home bench. Fans vented their spleen on social media, they are entitled to their opinion. But perhaps a brief squint at the bigger picture may lead to a more balanced view on Saturday’s game. Matlock ideally would have wanted a glorious victory but to their credit a spirited visiting outfit would not let that and they deserve immense credit for their resilience and spirit, Those plaudits would be nd. Matlock gave a debut to reserve team winger Jordan Wells and also included Jordan Chapell on the opposite flank. Michael Williams featured in central midfield while Brad Beatson was in the back four again with Greg Tempest, Michael Hollingsworth. Luke Hinsley and perhaps surprisingly Chris Salt not in the first eleven after the defeat at Grantham seven days earlier. Chapell rifled a shot goalwards in the 6th minute which was both high and wide before his low centre from the right was cleared unconvincingly by Callum Harrison’s long boot. Margetts again looked for joy on the right but was eased out of the equation before later Margetts and Craig Westcarr fought for joy but were denied in quick succession.. But MARGETTS broke the deadlock with a spectacular header directly into the top cornered cross from Lee Beevers on the right. The ball comprehensively beat Exall as it nestled into the top corner. Surely this was the kickstart Matlock so desperately needed. Margetts and Williams both went close at the end of the half. The interval came at a bad time for Matlock for when Dave Frecklington’s troops were ready for the second half, they were unable to recapture their earlier dominance. It took until the 78th minute for Matlock to threaten again, Margetts knocking down a Williams cross for Chapell to fire straight at Exall. A Josh Vickers strike drifted wide on 48 minutes and Durrant mopped up a couple of times as last man. But Matlock were never in serious danger save from an unlikely screamer or a big deflected effort that would leave Durrant staring in disbelief. At the end of the day, cultured performances are hugely important, more so to the paying public. But Matlock, perhaps sensing it was one of those days, did something they have seldom done this season. They kept the back door firmly shut so that nightmare moment simply couldn’t occur. They at least deserve credit for that and collecting maximum points. A potential banana skin had been successfully avoided as they recorded a first league double of the season. Frecklington and his troops are a step nearer to meeting their objective when they were appointed of keeping Matlock in the league. Matlock though are far better than this.